Cross 2 items of our Summer Bucket List! Early Thursday morning, we headed to the train station bound for Chicago. Not only were the boys getting a train ride, but we were off to the Shedd Aquarium! My oldest has been on the train before, but he didn’t remember it, and this was the first trip to the Aquarium for all three. We packed everything into one rolling suitcase, one rolling food/diaper bag, and brought along the collapsible wagon. Our plan was to walk from the train station to our hotel, drop off bags (even if we couldn’t check in yet,) then walk to the Aquarium. I booked a hotel that was right on the way to our destination. We didn’t want to have to deal with cars/cabs and car seats, so we wore our sneakers and prepared for a lot of walking. My parents joined us for the train ride down, and were going to do some shopping just for the day. It was really nice to have the extra help. The boys were pretty good, but we couldn’t all get seats together. This made for a fun game of musical laps the whole ride down. We did buy each boy their own seat, but Grandma and Grandpa’s laps are much more fun. Plus, then you can see out the window. We arrived and found our hotel was really close to the station, which was awesome. What was also awesome? Our room was ready for us! It was only 10 am, so I wasn’t expecting it, which made it a great surprise. We dropped our stuff, took a bathroom break, and were off. Grandma and Grandpa walked us part of the way, then split off for some Michigan Ave. shopping. By the time we arrived, it was about 11 am, and it was super crowded. There was a huge line of people waiting to get in. We had been lucky enough to receive complimentary tickets*, so they were waiting at the Will Call. They also had an Accessible Entrance, which was great. We were able to pull our wagon in, took an elevator up one floor, and waited in line for our tickets. If you are heading down, I highly suggest you get there right as they open at 9 am or get your tickets ahead of time to cut down on your wait. We only waited about 10 minutes to get our wristbands. First up, we checked out the Caribbean Reef tank. It is a huge tank with tons of fish, a giant sea turtle, eels, and even a few small sharks. I think the boys could have stood there all day watching. There were so many different species, and they could get right up to the glass to see. It is right near the entrance, though, so we wanted to explore some other areas. There was a special Amphibians exhibit, so that’s where we headed next. My mom, who hates frogs, wouldn’t have been too happy, but the boys LOVED it. 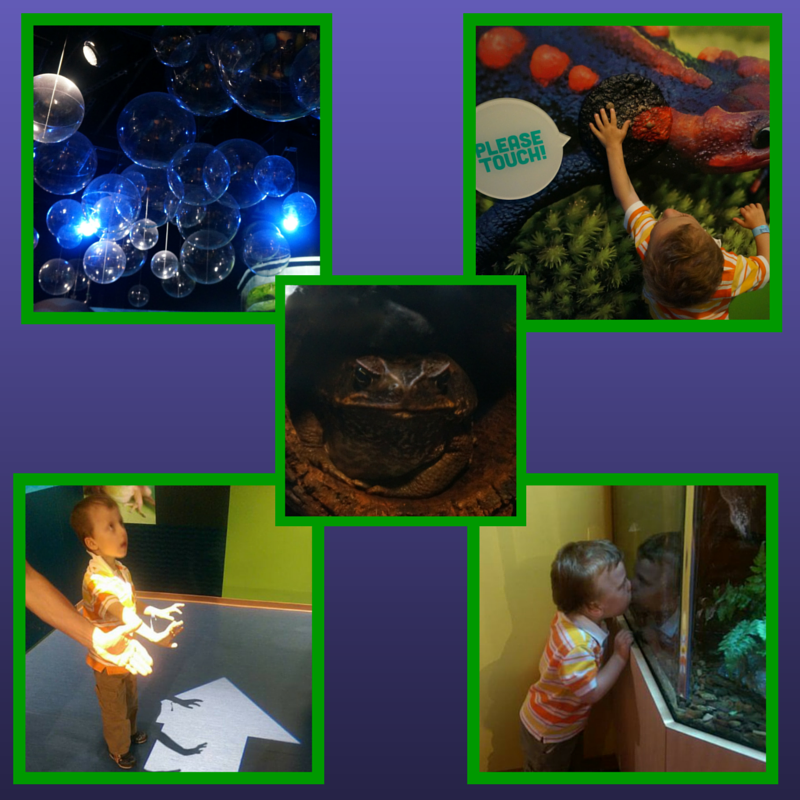 There were tons of frogs, toads, snakes, and assorted amphibians to see, plus lots of great facts on the walls, things to touch, and cool lights. Fun to look at and perfect to make shadows with. After the Amphibians, we headed to the Abbott Oceanarium. It was a little disappointing that we couldn’t see the Dolphin and it’s newborn (she just had her baby in June,) but we did get to see a lot of other cool stuff, like sea lions and Beluga whales. There was a play area for the kids that looked like a submarine. 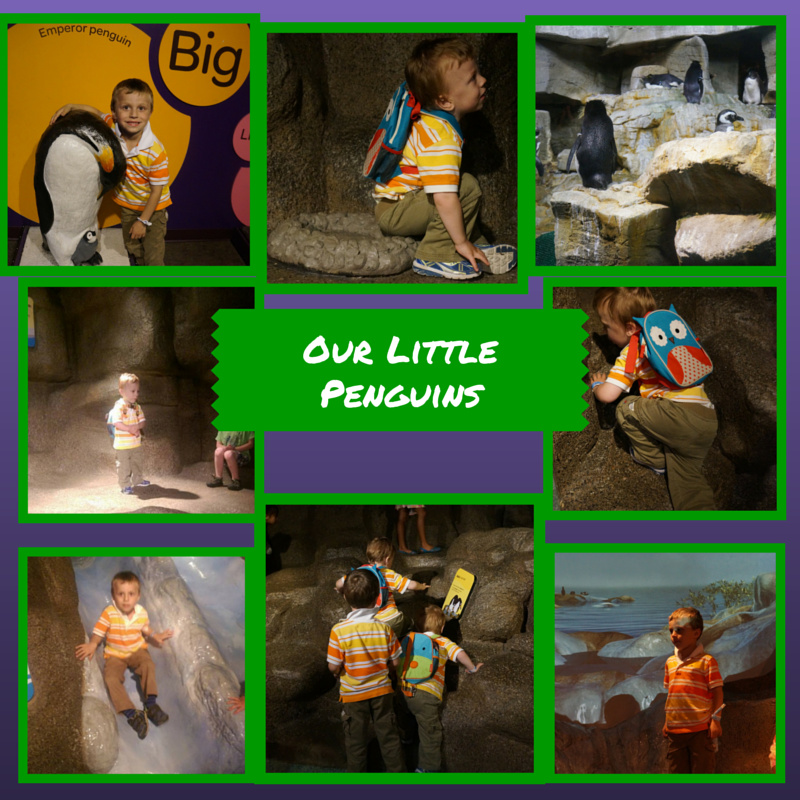 There were also Penguins, and a Penguin play area. The kids could put on Penguin suits and slide down “ice” slides. They also could climb around on rocks, and even sit in a Penguin nest, all while there was a big screen in back with Penguins doing the same. After we were all played out, we decided to get lunch. 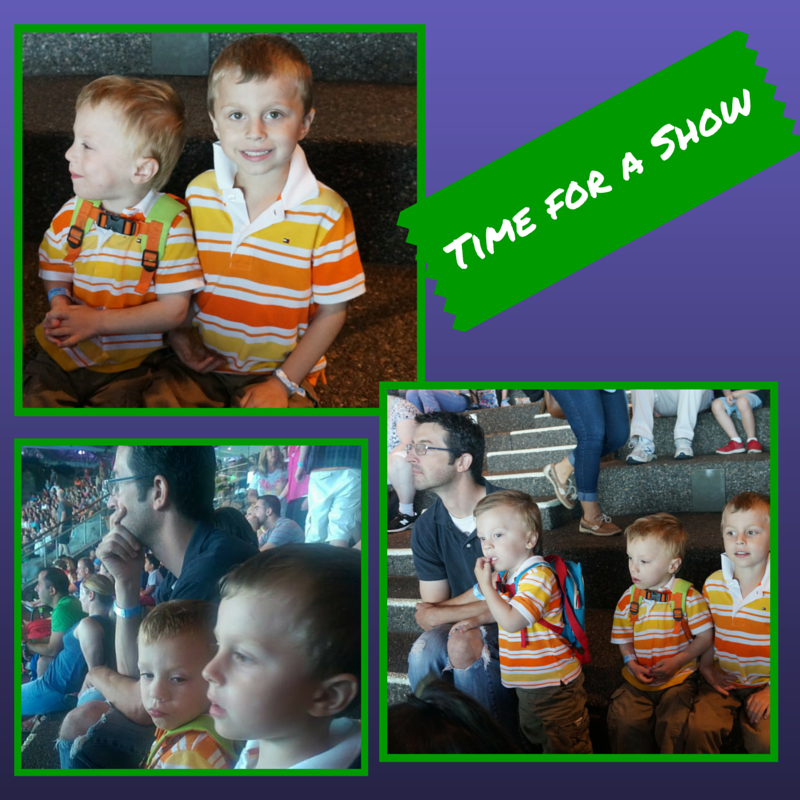 We had tickets for the 2 pm Aquatic Show, and wanted everyone to have a full belly before watching. Even though it was a little pricey, the food was delicious, and the view was amazing. By the time we finished eating, it was time to head into the theater. There was no assigned seating, but we arrived a little early and got great seats. The show was really cool. It was a mix of dolphins and beluga whales with their trainers in the water, information about the aquarium and it’s amazing programs on a huge screen behind, and animals that came out right in front of us. A rescued sea-lion and rescued dog were definitely the highlights for the kids…and me! After the show, we took one more lap around the main level aquarium tanks, and then decided to head out. There is just so much to see and do, that we’ll have to go back another day for the rest. Plus, I want to see that baby dolphin. If you’d like to see what else Shedd Aquarium has to offer (and it’s a lot,) just click HERE to be taken to their website. You can also find information on prices, memberships, and other nearby attractions in Chicago. A huge thank you to Shedd Aquarium for providing the tickets for me and my family to enjoy, including the new Amphibians exhibit and Aquatic show. While the tickets were complimentary, all opinions and fun were mine and my family’s. Ps. The trip isn’t over yet. Stay tuned next week to see how we spent the rest of our time in Chicago. 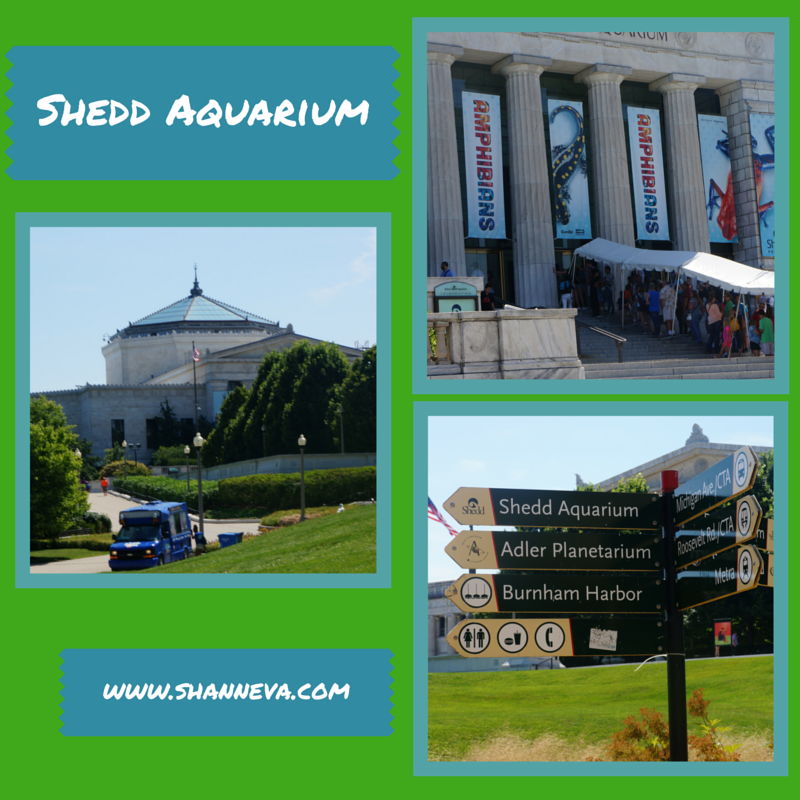 I have always wanted to visit Chicago and if I ever get there, I totally want to go to the Shedd Aquarium! I love the little one’s matching shirts. How cute! 🙂 Sounds like you all had a blast! I bet the boys just loved the amphibians. I’m partial to penguins myself…and aren’t sea lions the best? I had the chance to see them on a beach in CA this summer and since then, I’ve been in love with them. What a fun day! Visits to aquariums are fun for all ages. I would like the amphibian exhibit, too. Oh I love this post and it inspires me to want to do more adventure posts with my family on my own blog! I remember going to this aquarium as a kid and these pictures brought back memories! So fun, I love aquariums! This sounds like a good one. The one near us is nice, and I love the penguins, but they don’t have any shows or anything. My son LOVES the aquarium. This looks like a great one! I I haven’t been there in a long time but it was so much fun when I was there! Looks like so much fun awesome! That sounds so fun! My son’s fave part of our local zoo is the aquarium, so I’ve been considering taking a trip there- I think it’s like a 3-4 hour drive for us. Thanks for the tips! Ours too! You are welcome, and thanks for reading. You would love it, and Chicago. Come visit! So cute and what a great time! My kids love it there. We’ve taken the train there and made a day out of it! Yes! The train is so much easier than driving into the city. Yes, it was awesome. Thanks so much Dayne! Aw. Looks like you had so much fun! I have never been on a train and would most likely act like a kid myself if I ever got on one :). I love how you matched up their clothes. I used to do that with my boys when they were little and now my daughter does it too :). Love the family pics! Great lookin’ fam hun! I’ve always wanted to travel to Chicago.The aquarium looks like so much fun!! It is, and the city is so great too. Oh, what a fun trip! I’ve never been to that particular aquarium, but I would love to visit. And it’s always more fun with the grandparents along for the ride. Absolutely love the Shedd!! Buying tickets online was such a time saver! Ha! Too funny…and thank you! I’ve been to the Shedd before and it’s one of the coolest things I’ve ever done! I would love to go back! 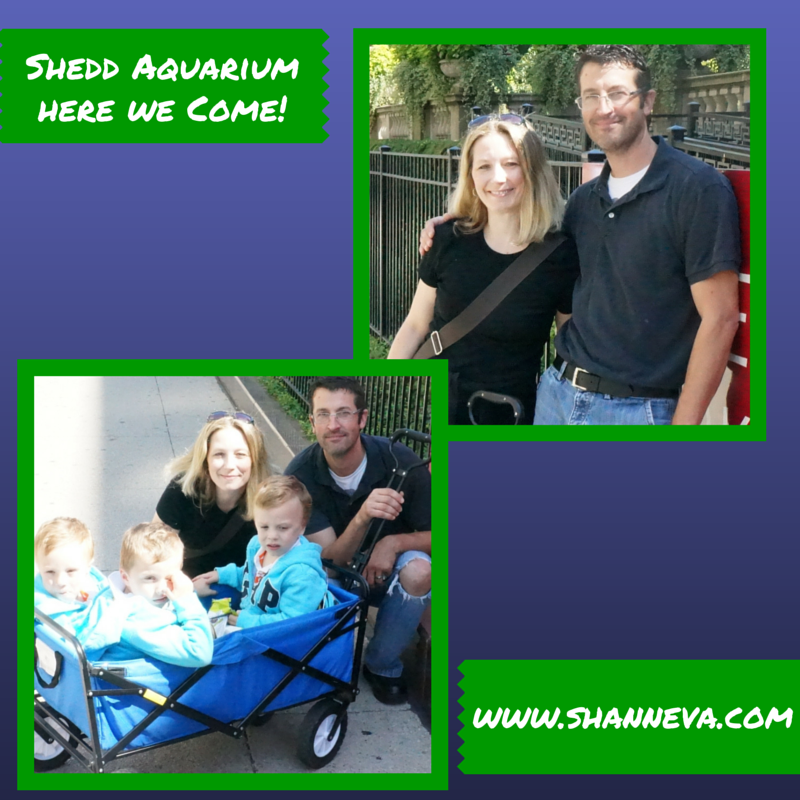 We went to the Shedd Aquarium a few years ago! It is so large! We didn’t even do half of it, partly because of the price but partly because I didn’t know how long my little ones would last! It sounds like your did awesome! I should look into getting tickets and sponsoring a post! Great idea! Looks like you guys sure had a lot of fun there! I wished there were aquariums in our area! I’ve always loved that aquarium (and Chicago in general). You’ve convinced me it’s time to take a trip back there again. You are one prepared momma! This was such an informative post. I enjoyed it even though I do not live near this aquarium. You helped remind me that I need to be a better planner. Thanks girl! We LOVE the Shedd! Sadly, though we live in the Chicago suburbs, we haven’t been in a few years! Thanks for the reminder to get our butts over there! ? Glad you guys had such a great time! 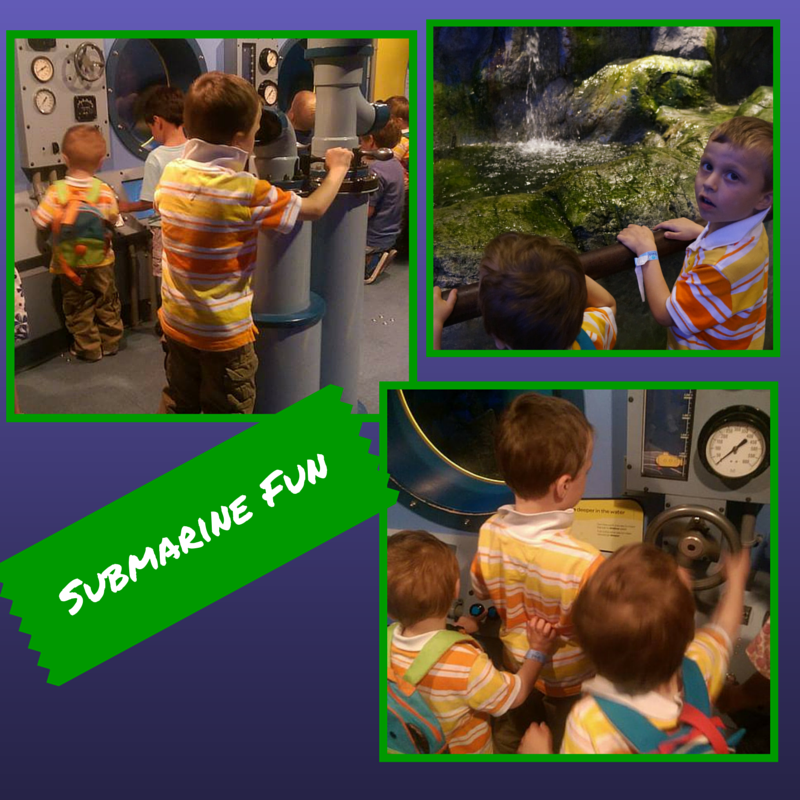 What fun you had at the Shedd Aquarium. 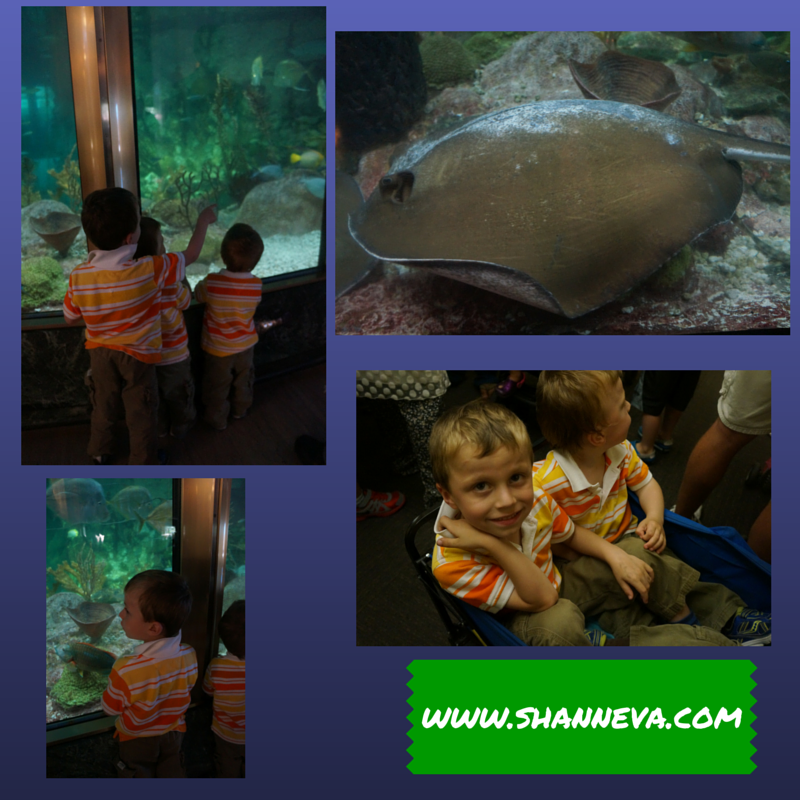 We love going to aquariums and I have added this to our list of our must visit places. The sealife is strange yet wonderful for me, so I love going to parks or aquariums that feature different fishes and animals that live under water. Looks like you guys had a fantastic time! I love the She’d Aquarium! I grew up in Chicago, but we have since moved to Dallas. I keep trying to figure out a way to get back there to share it with my daughter! Yes, you should. Hope you make it back soon! My first visit to your blog via Corina’s group. So glad to meet you. Thanks for this wonderful experience you have shared with your children. I don’t know what I enjoyed most…the pictures of the Aquarium, or the look of splendor of the children. An aquarium is a great idea for a day out. The boys can run around in a controlled environment and they get to look at fishies. It looks like you had SO much fun! I love aquariums and zoos. I love watching the kids’ faces more than anything. So fun! I haven’t been to Shedd in a long time, but I love it! I bet they had a lot of fun! 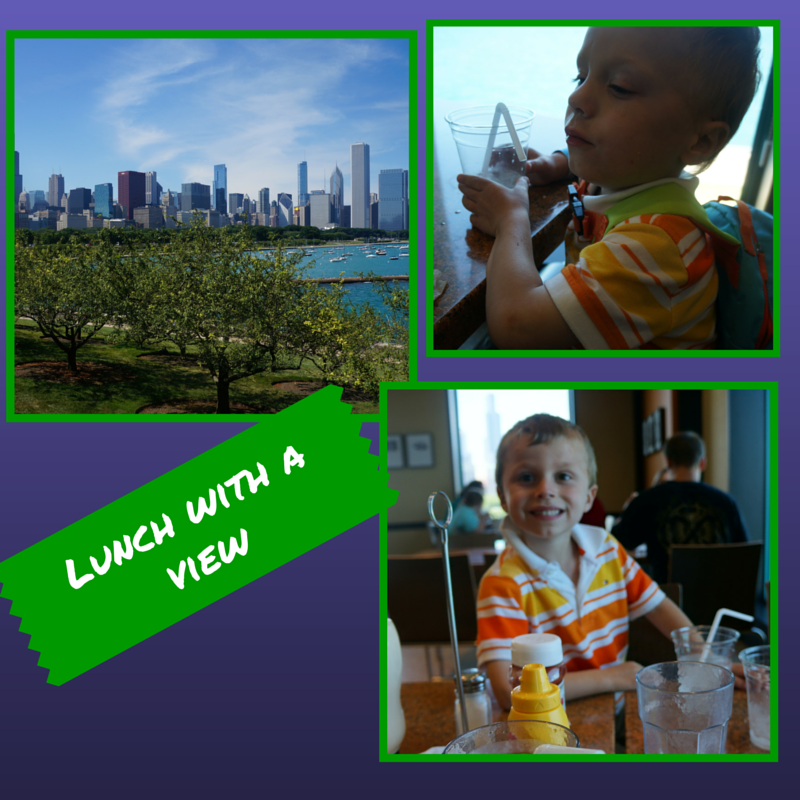 The manta was gorgeous, as well as the view during lunch! Looks like it was a great day! We have an aquarium in Toronto that recently opened and we have yet to go visit. But I’m looking forward to it when we do. Happy to be co-hosting with you again at #HomeMattersParty. This looks like so much fun. Aquariums are my favorite place to visit. Thanks for being such a great cohost on #HomeMattersParty.